This review previously featured in the Weekend section of The Tribune on November 6. The law of unintended consequences tells us that whatever we might intend to do might not always work out as we thought it might. That being the case, what will be the consequences of our continuing experimentation with new forms of communication. This week's podcast review takes a look. 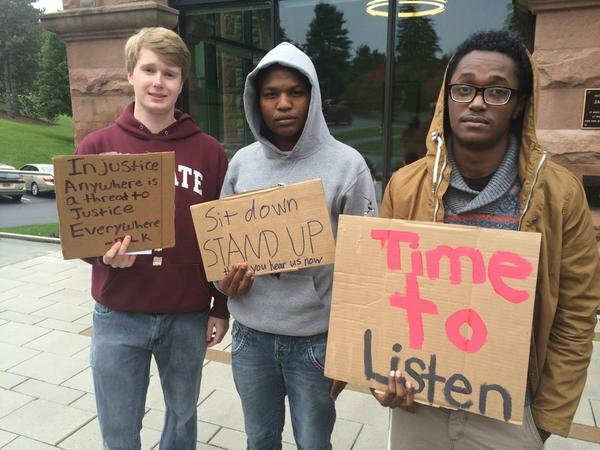 A post by Twitter user @Sunny_and_Char showing Colgate University students taking part in a three-day protest over concerns about racism. Reply All is a podcast that hopscotches around a number of topics – but two separate recent shows focused on apps that allowed people to communicate in different ways. The first of those is an app called Somebody which, rather than calling someone or texting someone, sends a message to someone near the person you want to contact and asks that person to deliver the message in person. The thinking behind the app is that messaging has become too impersonal, so having someone – albeit a stranger – deliver the message restores the feel of personal communication. Weird, right? Even weirder is the example they talk through – when a man at work has a strange man walk up to him and say hey, I totally love you. The podcast goes on to talk to both the man who received the message – and was somewhat startled by it – and the ex-girlfriend who sent it to him, asking why she chose this way to declare her love, and what the implications of it are. A second podcast from the same team looks at the Yik Yak app, and how it led to an explosion of racist debate at the Colgate University in New York State. Yik Yak is an app that allows people within a ten mile radius to post anonymously to its message board, and has taken off on college campuses as a quick way of sharing details about parties, gossip and so on. But at Colgate, it became used to target black students for racist comments. That led to a sit-in protest by students, which led to a flood of responses from people who had been affected by bullying and from those wanting to offer support. Teachers stepped in to help, posting positive messages to the app and, importantly, signing their name to each message, taking the anonymity out of the app's usefulness. The podcast chats to one student affected directly by the racist abuse and tells us at the end that she is back at the same university now, this time as a staff member, and doing her part to tackle racism. Concerns about technology have always been with us – early philosophers such as Socrates were concerned that books would bring an end to dialogue, for example, because you could not argue with a book and to him, knowledge was debate. Equally, he feared that books would be an end to memory, and that's a concern that some have expressed over technology. When was the last time you memorised all the phone numbers in your phone, for example? Or who starred in such-and-such a movie when you can just look it up on imdb.com? Or memorised a poem rather than look it up on the web? However, the show host and his guest argue, memory has always been an unreliable tool. Often, we have relied on our social network – wife or husband, friends, colleagues – to prompt our memories for different things, and technology expands that social network. Find yourself nowadays in a zone with no internet access and, guest Clive Thompson reflects, you find yourself being less curious, just because you have lost your way to double check. And this isn't a new thing, he says, citing the encyclopaedias that used to gather dust on people's shelves and were perhaps checked once a year. Concerns remain – such as new technology making it easier to find people who agree with you and make you feel you are right, even if you are blatantly wrong. It's a fascinating debate, discussing how our interactions have changed with the effects of different technologies and, while a little over an hour long, you feel you could go on listening forever. After that lengthy podcast, here's a bite-size one. The NPR Technology podcast is a series of snippets, five minutes or so each. A recent one discusses in just three minutes a plan by The New York Times to deliver virtual reality glasses to its customers and to begin producing journalism in that format. A vision of a migrant's journey in virtual reality is one possibility mooted. A child's return to his war-damaged country is another. What will be the effects of putting people in the virtual shoes of those in the news? That, we shall have to remain to see.